You can check the cost of your domain renewals at any time through your GoDaddy account. 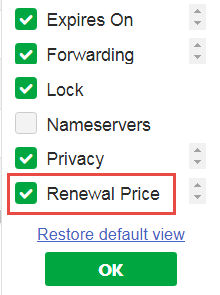 The renewal price of any domains you own will now appear on the right side of your dashboard. CANCEL or TURN OFF auto-renew. Domain privacy cost and potential removal? Why are domain renewals costs not displayed anywhere in account information? What is locking a domain name and how much does it cost at Godaddy ?